Carli had a lot of interests in her brief life. Here is a look at a few of them. This page is a work in progress, more will be added later. Both Carli and her mother were avid baseball fans and followed both the Winnipeg Goldeyes and Toronto Blue Jays. They attended Goldeyes games at CanWest Global Park and followed the Blue Jays via television. In her last year of life, Carli was able to make it to two Goldeyes games in person, the most recent of them came on 12 July 2007 when the Goldeyes beat the Fargo-Moorhead RedHawks by a score of 5-3. Shortstop Max Poulin hit a 3-run homer in the bottom of the sixth to break a 2-2 tie and propel the Goldeyes to victory, much to the delight of both Carli and her mother. Carli made it to and from her seat with the aid of a walker, and her lack of mobility didn't stop her from standing and applauding Poulin's homer or from standing for the seventh inning stretch that night. Twenty-year-old Jenna moves quietly along the line of dogs. She checks all the snaps with meticulous diligence. Reaching the sled, she pauses to reflect on her long journey to this moment. At seven years old, Jenna is about to start grade 1. It’s a big step for her. Having not attended pre-school or kindergarten, it is the first time she has been away from home without her parents. Most of the kids at the school are nervous, just like all those who came before them. For Jenna, however, a small difference has a huge effect. As a high-functioning autistic person, Jenna is oeverwhelmed by all the “new”. Her parents introduce her to Rose, a kind old woman. Rose will stay with her, Rose will help her as she learns new things. Jenna and Rose enter a small room. There are other kids there, some are in wheelchairs, while others seem normal. All of them though, each have a helper like Rose. Once they are sitting, Rose puts a piece of paper on the table. “Let’s try adding numbers,” she says, then notices Jenna’s attention is somewhere else. It’s been many years since she first heard the story of Balto the sled dog. Now along with a team of young dogs loaned to her by Karen Ramstead, Jenna is standing at the starting line of the Yukon Quest, one of only two sled races to have a route that spans more than 1000 miles. Jenna watches as the seconds on the clock move towards the next minute. “You ready for this?” asks Mark Ramstead. Jenna stands firmly on the sled, one foot on a runner, the other on the brake. The dogs are ready now, but if she leaves early, there will be a penalty. She alone must hold the dogs back for these final seconds. Soon the crowded city of Faribands, Alaska will be behind her. Then, it will just be her and the dogs. As they cross the city limits, Jenna smiles. She trusts the dogs, the dogs trust her, and this, is the moment they’ve all been waiting for. Jenna looks around at her large family, then blows out the candles on her cake. Once the cake has been eaten, the attention turns to the gifts. A lot of the gifts are clothing, and Jenna is happy that everyone remembered that she had simple tastes when it came to clothing. She certainly agreed that a layer of lace on the front of a dress was pretty, but it was too easily torn and the dress would tbe thrown away too soon. A few gift certificates to various large stores were given, and Jenna was pleased when her anut Lucy announced that she had faithfully renewed Jenna’s subscription to Mushing Magazine. When the rest of the gifts were opened, Jenna’s parents stood up. They had told everyone that their gift to Jenna was too large to fit in a box. They now announced that uncle Tony had loaned them his motorhome, and that they were taking Jenna on a 3-week vacation to Alberta. Jenna seemed pleased with the gift, but everyone knew she would be delighted when she found out the exact destination. Two days later, Jenna’s father turned the motorhome onto highway 2 and proceded north out of Edmonton. He was glad Jenna was playing cards with ther mother, and not paying attention to where they were. Soon, they turned off the highway and parked next to a country store. He announced that they had arrived, and that he had seen their host approaching in the distance. Leaving the motorhome, they looked around. The name of the store immediately caught Jenna’s attention. Perryvale General Store. Jenna gasped. They were in Perryvale, Alberta, the home of Karen Ramstead and the North Wapiti Kennels! A quick look along the road revealed only one approaching vehicle, an ATV being pulled by 14 dogs. “I thought dogs pulled sleds.” said Jenna’s mom, looking a bit puzzled. The days passed quickly at North Wapiti. There was so much to do. Jenna made it a point to help with each chore. She needed to learn what it would take to be a musher. She also rode on the ATV with Karen several times, and by the middle of the second week, Karen even let Jenna drive the team. Late one evening, after Jenna had gone to bed, the adults discussed the visit over mugs of hot chocolate. “Well, she’s definitely got potential, and she’s good with the dogs,” remarked Karen. Jenna’s mom sighed. “From what I’ve seen in these two weeks, I don’t doubt she could be a musher, but I’m worried about how well she could take care of herself if she’s alone. Photography is an interest Carli had going back to New Brunswick, when she had a very simple camera and would take the odd picture. With advances in technology, she worked on her shooting skills with better cameras. With a lot of practice on her own and with some coaching from Hartmut Sager, she got better. She was particularly proud of one shot she took at the Government Forks in Winnipeg that she showed off. Since her father Gary is a professional photographer, perhaps the love of the camera was in her blood from birth. Carli had a tremendous interest in Digimon, a popular Japanese anime series. She had developed many friendships through the Internet through her passionate interest in Digimon and had created her own site off her Geocities page called “Cubmon's Den” that shows her interest in the digital monsters that are a manifestation of the Earth's communication network. She also started another Digimon site at ultimatedigimon.com and it rapidly grew in popularity among fellow Digimon fans. In fact, ultimatedigimon.com was the first domain name Carli had registered. Carli's interest in the world of dog sledding came back in New Brunswick that started when she saw the movie Iron Will. 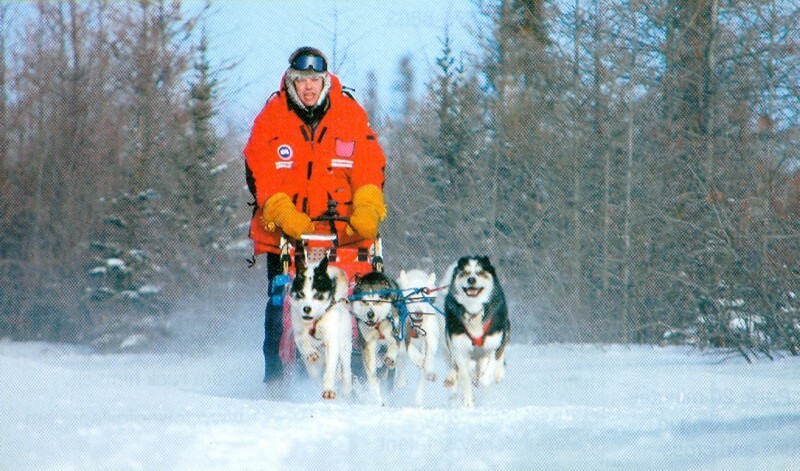 She passionately followed the Iditarod race and had the opportunity to attend the Canadian Challenge race in northern Saskatchewan in early 2007. Carli had pursued a number of other interests in addition to those listed above. She was actively involved in editing pages on Wikipedia, even up until the time she was in Grace Hospice. She was a fan of science fiction classics such as Star Trek and Stargate, and even had some flying lessons. On one occasion, she was able to take the wheel of a small aircraft. She liked to read adventure stories and other non-fiction. Going back to her time in New Brunswick, Carli enjoyed travelling. She often took a day liner between Moncton and Saint John and took one memorable trip by train to Halifax when she was 13. When Carli and her mother left New Brunswick, they took the train all the way to Alberta and Carli was able to do more travelling amid their frequent moves. Lite salad dressing: 500 Island.